Why is packing so hard? For as much as I love to travel, I hate packing with a passion. I always procrastinate until the very last second. And I always end up overpacking (what do you mean I won't wear these leather shorts?!) I've gotten a little better but my skills are still seriously lacking. I joke about the time I was packing for a trip to New York City when my friend Callie came over. She had all of her outfits neatly planned out and packed up in her carryon. Sounds simple enough, right? I was at a loss, staring down at my suitcase. Its contents? My curling iron and a bikini. For a trip to NYC. Right. In my defense, it was July, but still. It didn't take long for my travel buddy to call me out. "What are you going to wear that with?" Now I've graduated to throwing anything I could possibly fathom myself wearing in any given locale a few days in advance. That gives me a few days to pare down any unnecessary items (read: toss out about half of what I stuffed in there). Given what I do for a living, you'd think I'd be better at editing my clothing selection. I guess everyone really does need an editor. So, true to form, I'm ignoring the overflowing suitcase laying on my floor and blogging about enchiladas instead. But not just any enchiladas! I'm talking fully loaded tortillas, baked in sauce and cheese. I had a friend over for dinner before the holidays and couldn't decide what to make. I needed a recipe that would use up my sad selection of food in the fridge. 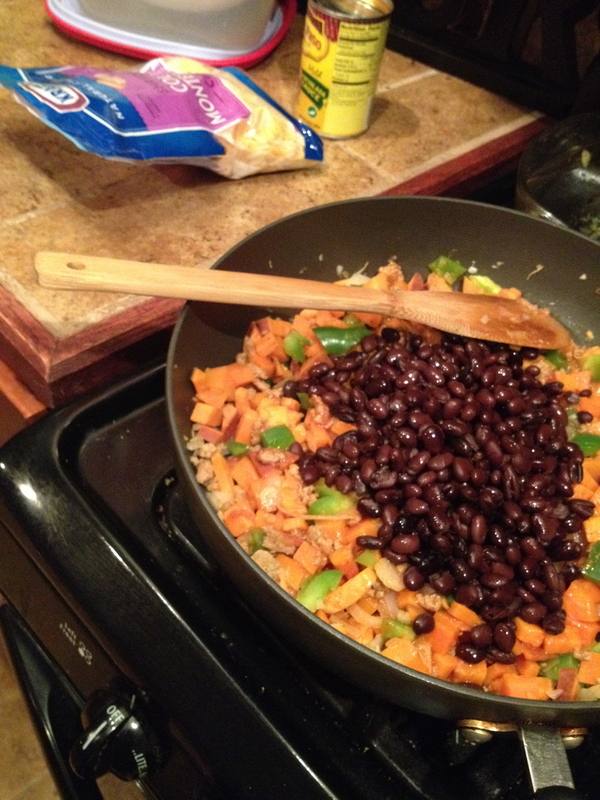 What could I make with leftover black beans, a handful of carrots, and a lonely sweet potato? I was determined to avoid a trip to the store, also known as leaving my warm apartment in sub-zero temps. I remembered the ground turkey in my freezer and was suddenly inspired. Having never made enchiladas before (crazy, I know), I decided to give it a try. I combined the ingredients in this recipe for Potatoes and Carrot Enchiladas and the no-roll technique in this 5-Ingredient Beef Enchilada Casserole. Brown the turkey in a skillet, stirring in taco seasoning packet, or add your own spices. I combine chili powder, cumin, paprika, garlic salt and pepper. Transfer cooked turkey to a bowl and sauté veggies in the same pan. Add the veggies and half the can of enchilada sauce to the bowl of turkey and combine. Stand the tortillas up in an 8x8 dish. Fill tortillas, fold over, pour remaining sauce on top and sprinkle with cheese. Bake at 350 degrees for about 30 minutes. Pre-sauce, cheese and oven. They were so tasty, we scarfed down half the pan before I could think to take a photo of the end result! This recipe serves four but you could easily double for eight. You could even use your muffin tin to make enchilada cups, like these Spicy Chicken Eggplant Enchilada Cups. Leftovers reheat well and make an awesome next-day lunch. I hope you enjoy!